Social media has been recognised as an effective tool to advocate and do politics, as Taiwan President Tsai Ing-wen’s Twitter account may attest. Since last December 2016, at the same as Trump’s election as new President of the United States, Mrs Tsai Ing-wen has been resorting to Twitter to reach a broader international audience and give voice to Taiwan’s right to self-determination. After the recent unfortunate diplomatic events, the digital activity displayed on her account may help Taiwan in raising global attention of its isolation in favour of the One-China principle. TAIPEI, Taiwan — Over the past year, China has doubled down on its campaign to reduce Taiwan’s presence on the world stage, whether by luring away its few remaining diplomatic allies — most recently Panama — or blocking its participation in international organizations like Interpol and the World Health Organization. Now President Tsai Ing-wen of Taiwan is trying to tweet the island back into the global conversation. Ms. Tsai had her first encounter with Twitter’s reach in December, when Donald J. Trump, newly elected to the White House, wrote on Twitter that she had called to congratulate him. His announcement made headlines around the world. It was believed to have been the first time an American president or president-elect had spoken with a leader of the island since at least 1979, when the United States broke diplomatic ties with Taiwan, formally known as the Republic of China, as part of its recognition of the People’s Republic of China. Weeks later, Ms. Tsai revived her moribund Twitter account, posting regularly in English and sometimes in Japanese. Since then, her followers have nearly tripled. Her office says her rekindled interest was spurred by outreach from Twitter itself, not by the Trump episode. But there are certain parallels between Ms. Tsai and President Trump. Where Mr. Trump uses the service to bypass what he considers a biased news establishment and to address the public directly, Ms. Tsai appears to see it as a means to circumvent the diplomatic isolation imposed by China. “Twitter, and more broadly, digital diplomacy, provides Taiwan with an easy and cost-effective way to connect and engage internationally,” said Danielle Cave, a Google Policy Fellow at the Digital Asia Hub, a nonprofit organization based in Hong Kong that researches society and the internet. “Frankly, Taiwan’s future is tenuous, and their international space is increasingly limited at a time when they need their voice to be heard more than ever,” Ms. Cave said. China claims self-governed Taiwan as part of its territory, and its diplomatic relations with other countries are conditional on their agreement not to recognize the island as independent. That has led to Taiwan’s exclusion from the United Nations and other international forums. 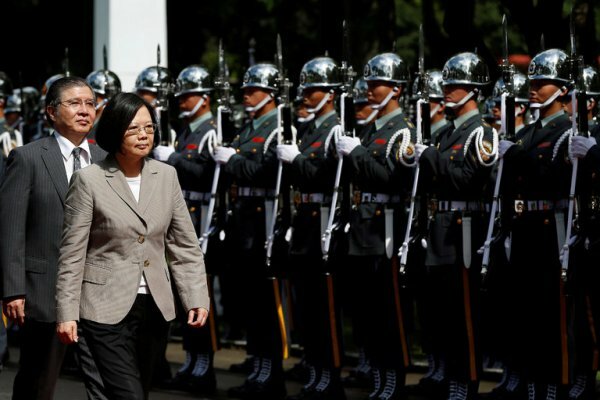 Only 20 countries maintain formal relations with Taiwan, a list that has shrunk by two since Ms. Tsai took office in May 2016. She has resisted demands from Beijing that she endorse the so-called One China principle, which holds that Taiwan and China are part of a single country, although each side has its own views on how that country is defined. In December, Mr. Trump briefly cast doubt on America’s adherence to its One China policy, when he broke with longstanding practice by sharing a call with Ms. Tsai. He later said he would honor the policy, but his Twitter message announcing the conversation stunned China watchers and gave Ms. Tsai her first taste of global exposure on social media. Weeks later, Ms. Tsai stopped by Twitter headquarters in San Francisco, on her way back from visiting diplomatic allies in Central America. The company had contacted Ms. Tsai’s office about reviving her account, said Vincent Chao, chief of staff to the secretary general at the Presidential Office. Ms. Tsai, who joined Twitter in 2010, had previously posted in Chinese, but she stopped in May 2014, primarily because relatively few people in Taiwan use the service, Mr. Chao said. For domestic engagement, Ms. Tsai posts in Chinese on her Facebook page, which has more than 2.1 million followers. Describing the past few months of Twitter diplomacy as “fairly successful,” Mr. Chao said that the number of people who follow the account had risen since January from 36,800 to more than 100,000. They include foreign journalists and others who can communicate Taiwan’s positions. “There’s a core group of people working on Twitter that have been with President Tsai for quite a while, and we also have people who provide input from the Ministry of Foreign Affairs and other government agencies on specific issues,” he said. Since her return to Twitter, Ms. Tsai has posted more than 100 times. Initial messages rarely broached sensitive subjects. But that has changed in recent weeks. In May, she wrote 13 times about Taiwan’s exclusion from the World Health Assembly, which happened at Beijing’s behest. Many recent posts have dealt with attempts by China to isolate Taiwan, including Panama’s decision to sever diplomatic ties with Taiwan in favor of recognizing Beijing. “China’s coercion & threats won’t bring two sides closer, they will drive our two ppls apart. We will never surrender to such intimidation,” she wrote hours after the news broke. On the anniversary of the June 1989 military crackdown on pro-democracy demonstrators in Tiananmen Square in Beijing, Ms. Tsai also posted several times, saying the protesters “inspired a generation” and offering to share Taiwan’s experiences in its own transition to democracy. Although Twitter is blocked in China, some citizens who employ virtual private networks to bypass their country’s “great firewall” are clearly following Ms. Tsai’s account, and even the state news media is taking note. Last week, People’s Daily used Twitter to call attention to an article titled “Taiwan leader’s Twitter post infuriates the public,” in response to her message in which she thanked Japan, in Japanese, for its support of Taiwan’s bid to join the Trans-Pacific Partnership trade deal. Mr. Chao welcomed the new online arena for cross-strait engagement.